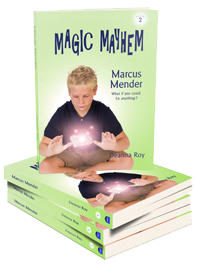 The Magic Mayhem books are a series for middle grade readers aged 8-12 who love magic, adventure, and outsmarting the grown ups! A new school didn’t help. 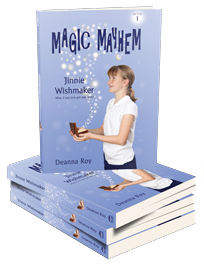 But will discovering her magic power solve all of Jinnie’s problems or cause more? 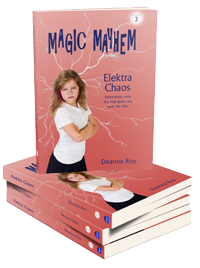 In book one of the Magic Mayhem series, an eleven-year-old girl discovers she can grant any living thing its one true wish. But wishes aren’t like shopping — sometimes you ask for one thing and what you get instead makes your life very unpredictable! Download the Language Arts Common Core teaching materials PDF. Everything Marcus touches becomes new again. Even his math homework becomes a blank page. Now he needs to save his friends, but how can he do that when he’s been turned evil? Marcus can fix any object just by touching it. But when he and his friends are sent to South America, a magnetic storm causes the forces of good and evil to be reversed. Now he and Jinnie are the bad guys! Only he can set things right, but with hew new image as a force for mischief, he’s going to have to fight his own power to do the right thing. She’s been the baddest bad girl since she got her magic. Even the school bullies stay out of her way. But now her power is a force for good and the world depends on her to save the day. Elektra never wanted to be the good guy. She loved her bad-girl image and the ability to scramble anyone’s thoughts with a zap of her magnetic power. But when the forces of good and evil are switched, she realizes that sometimes only the bad guy can save the world. 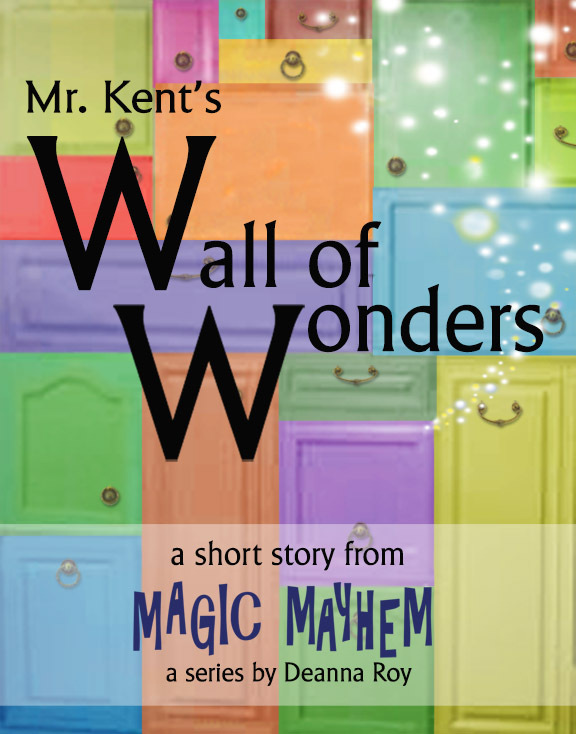 Deanna also wrote a short story called Mr. Kent’s Wall of Wonders. You met Mr. Kent, the school counselor, in Jinnie’s book. But in the short story, you learn more about the enchanted objects he filled with magic when he was a kid, including the hula hoop time machine, the jump rope of invisibility, and the lip gloss that sealed his sister’s lips shut so she couldn’t tattle on him! It’s a free download pretty much everywhere! Deanna was also part of an anthology of short stories for 9-12 year olds that is free to download most places. Enter: Ten Tales for Tweens.